Welcome to the Sew Pro Stars Blog Hop! Here you will find a variety of sewing projects inspired by the information and interactions from Sew Pro 2016. In September, I took a bold step in building my quilting business. I traveled from Phoenix to Chicago to attend the Sew Pro convention. It was a gathering of sewing professionals to meet, mingle, and learn some business-building strategies. The organizers, Brenda Ratliff of Pink Castle Fabrics, and Sara Lawson of Sew Sweetness, planned four tracks of lectures. Attendees could choose from pattern designers, fabric designers, authors, and bloggers. Lecture topics ranged from publishing tips and intellectual property rights, to technology tools and the travelling teacher life. When I returned home, I knew I wanted to continue the collaboration with the wonderful people I met. I reached out to my fellow sewists on Facebook, and we agreed to share during this blog hop. Please visit everyone and prepare to be dazzled by the amazing creativity and talent! 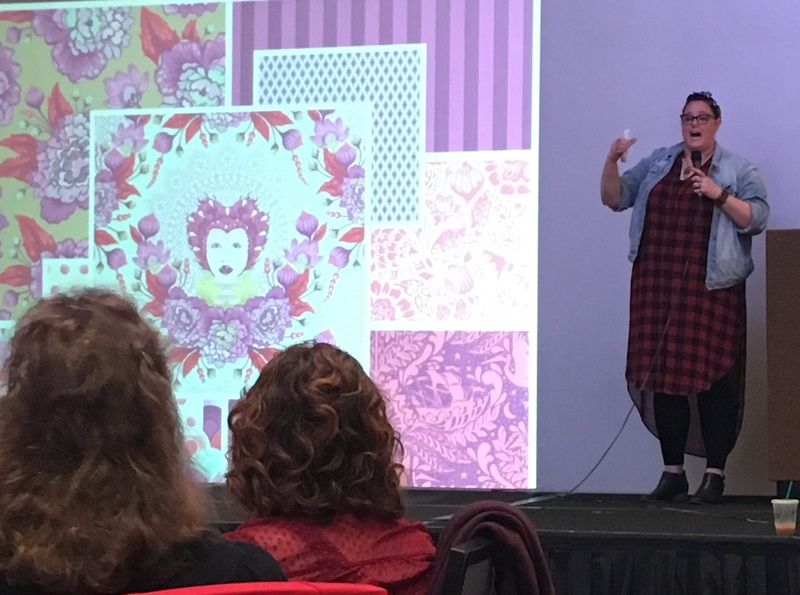 At Sew Pro, our keynote speakers were Pat Sloan and Tula Pink. I came home with pages and pages of notes just from those two speakers. The conference was jam-packed with great information about the opportunities for quilters and sewists in the larger fabric industry. As I pondered how to express the lessons from Sew Pro within a fabric-based project, I explored Pat Sloan’s website. 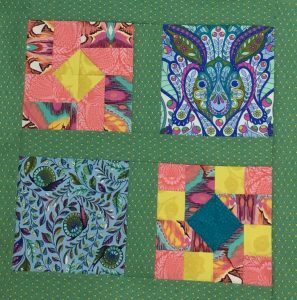 She is a powerhouse in the quilting world, hosting a weekly podcast as well as designing quilt and writing books! You may have heard of one of her little projects…the Splendid Sampler, a 100-block quilt along that has thousands of participants. From the Splendid Sampler patterns, I found the perfect block to represent Pat and the Sew Pro conference: #61 Traveler, coincidentally published on the weekend we were all in Chicago! Tula Pink is an amazing artist. I love her color sense and the whimsical animals she designs. 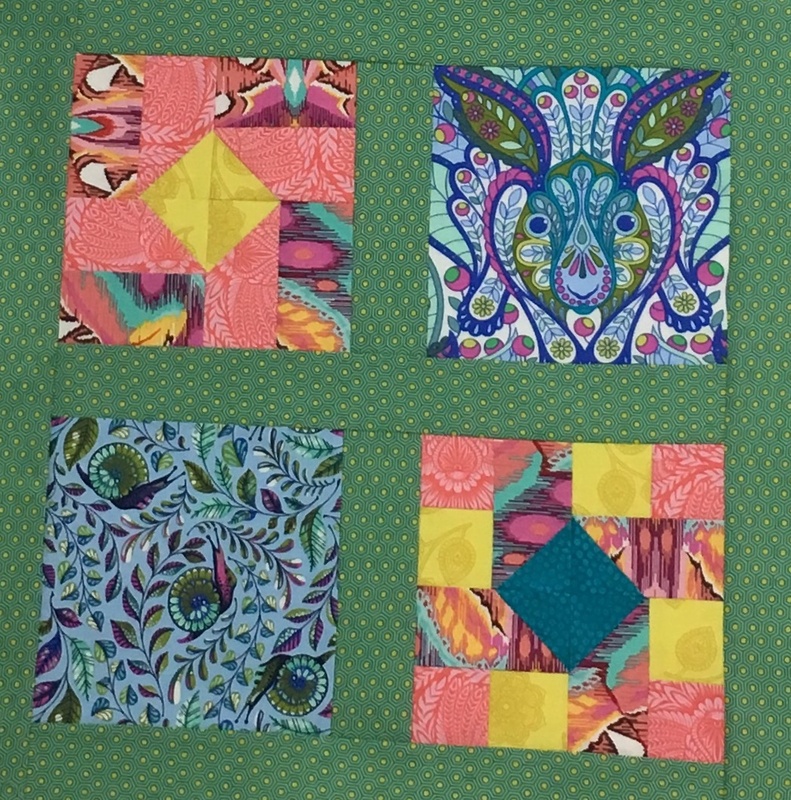 The Traveler blocks were made with fabrics from her Eden line. Also, I am featuring two prints from her new line, “Slow and Steady.” The hare is a tribute to my mom, a collector of porcelain rabbits, who inspired me to quilt when she opened a fabric store. The snails remind me that building my business is not a sprint. The Traveler blocks signify life’s journey…my trip to Sew Pro and all the places quilting has taken me. I can’t wait to see what comes next! I hope we can meet up again!! Thanks for reaching out to us and getting the ball rolling for this hop! Thanks for all you did for getting this hop jumpin’!! I’m enjoying reading all the blog posts! I absolutely love your blue blocks. If the name of your blog indicates a fabric color preference, I’m with you all the way! That’s probably what I have the most in my stash. =) And stars, who can go wrong with stars? I think I’ve found a new blog to read! I think we’ve met in person…years ago at Cotton Fields! Great post about Sew Pro. And your book is lovely too. Andi!!! I love your blog and all your freemotion tips!!! I just couldn’t stop reading after reading the Sew Pro post!! I love that you made the travelers block for Sew Pro! Pat Sloan has certainly taken her show on the road!! Thanks for facilitating the blog hop and I look forward to collaborating in the future!! It was great meeting you at Sew Pro!!! Yes, I want to partner with you Deanna! Thanks for supporting the blog hop. Here’s to a fabulous 2017!! Perfect choice for a block! I’m so glad we met at Sew Pro. It’s fun going through the blog hop and seeing what others saw. It really was a phenomenal event. Can’t wait for the next one!! Those keynote speakers were amazing!! So much information and inspiration. Your collaboration leadership is inspiring!! Thank you! Glad you joined in the fun!